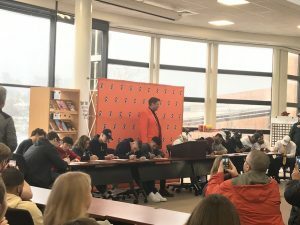 Congratulations to our student athletes and military-bound students honored on National Signing Day! The recognized students going to military service are: Skylar Beden (Army), James Gides (Marines) and Gray Karam (Marines). Signing earlier this year were student athletes: Jonathan Machamer (Baseball), Maria Welch (Track), Samantha Hackenbracht (Softball) and Brianna Danzy (Volleyball). Congratulations! Your school and community are very proud of you!